GEONETCast is a global network of sustained and cost-effective satellite-based dissemination systems. It delivers Earth observation (EO) data and products to and from GEO community activities, initiatives and flagships on a routine basis. GEONETCast is a GEO foundational task and an integral part of the GEOSS Common Infrastructure (GCI). It facilitates access to data to support the GEO Societal Benefit Areas. It contributes to the implementation of GEOSS, as defined in the GEO 2016–2025 Strategic Plan. GEONETCast is based on collaboration between China (CMA), EUMETSAT and the US (NOAA). Its architecture is open and can accommodate other partners. Its operation is based on various regional broadcasting systems, with established routine data exchange between them. It relies on infrastructure put in place, and sustained, by meteorological agencies. This creates synergies and complementarities between GEO-related data and routine data delivered for operational meteorology. GEONETCast currently serves approximately 6,000 users in 169 countries. GEONETCast is made available to support GEO objectives. It focuses on providing support, in term of data access, to and from GEO Flagships, Initiatives and Community Activities, considering priorities for each region. GEONETCast is also used for ad-hoc data transmission where high speed landlines and/or internet are not available, or in regions where terrestrial communication lines have been disrupted by disasters. GEONETCast is able to disseminate high volume data worldwide, even to areas with limited access to the internet. GEONETCast delivers a wide range of EO satellite data and products, generated by CMA, EUMETSAT, NOAA, and many third-party providers. The range of products covers applications relating to weather forecasting, atmospheric composition, marine meteorology, oceanography, and land management. Building capacity is one of GEONETCast’s achievements. In addition to providing data access, GEONETCast, through its Training Channel, provides opportunities for users to further exploit the data they receive. is open to all GEONETCast data providers. GEONETCast, through its Disaster Channel, is available to deliver products in support of the International Charter on Space and Major Disasters. Users wishing to explore the range of environmental data available through GEONETCast will find the full list of products in the Product Navigator and the GEO Web Portal. Several regional centres are responsible for establishing the satellite-based regional dissemination system — based on Digital Video Broadcast (DVB) technology — and providing complementary services to a common user community. GEONETCast is currently available in Europe, Africa, the Americas and Asia-Pacific region. 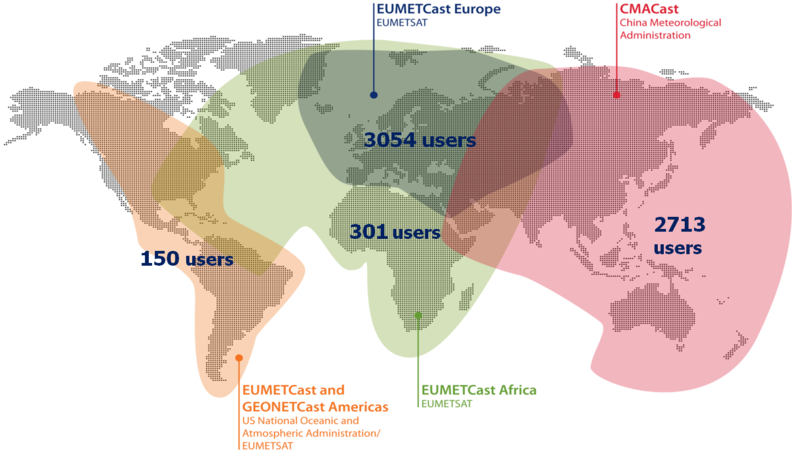 EUMETCast is the EUMETSAT contribution to GEONETCast, with coverage over Europe and Africa and the Americas. Established in 2004, EUMETCast has more than 4,000 registered reception stations with more than 3,400 users benefiting from the environmental data it provides. 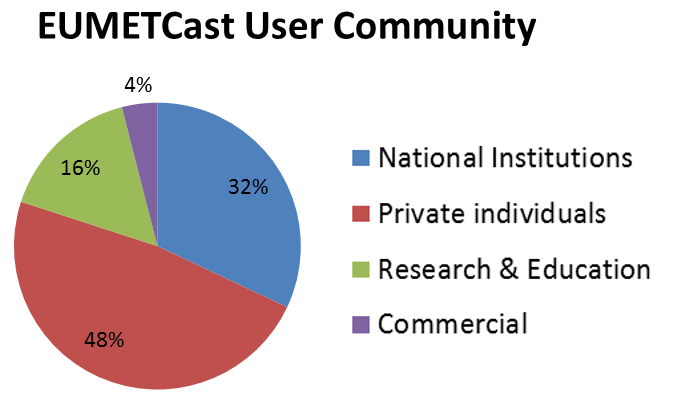 The EUMETCast user community is diverse ranging from operational meteorological forecasting centres to enthusiastic amateurs interested in remote sensing data. The large number of private individuals receiving EUMETCast is testimony to the ease with which a station can be set-up. CMACast is the China Meteorological Administration’s contribution to GEONETCast, with coverage over the Asia-Pacific region. CMACast utilises the AsiaSat 4 satellite beam to broadcast data and products to more than 2,500 users. As well as serving the People’s Republic of China, CMACast is used in 20 countries in the Asia-Pacific region. GEONETCast Americas is the Western Hemisphere component of GEONETCast, operated by NOAA. It provides data and products to more than 60 users in Central and South America and the Caribbean region. For the users, GEONETCast is a user-friendly, and low-cost information dissemination service. A typical GEONETCast reception station comprises a standard PC, a DVB reception device (internal or external), and a satellite off-set antenna fitted with a digital universal V/H LNB for Ku-band, or fitted with a circular polarisation feedhorn, bandpass filter and special LNB for C-band. To decode and decrypt the EUMETCast data stream, EUMETCast Client Software and a EUMETCast Key Unit (EKU) are also required. The cost of reception stations is kept to a minimum by using industry open standards as much as possible, resulting in an adaptable front-end solution to users' applications. In addition to the front-end equipment, proprietary client software used to decode the DVB signal and data processing software will be required. These software applications are commercially available. users, about the types of services they would like to receive. Please use the GEONETCast Feedback Form (PDF, 47 KB).